A last minute opportunity brought me to PAFF-055 Deelerwoud. It was snowing lightly - nothing to really spoil the late afternoon. I had been to this nature park before in the autumn but activity level was not very high at that time. A good reason for a revisit. 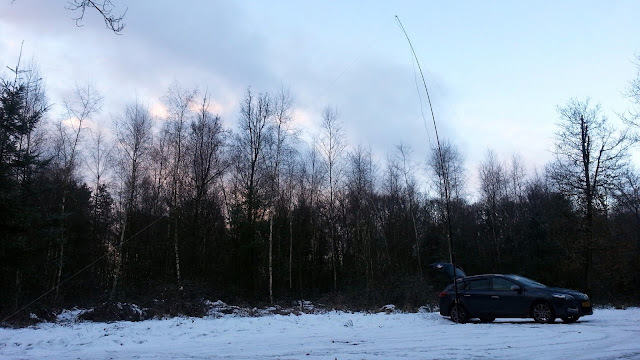 With 2,5 hours of radio time I focused on 20m and 40m. 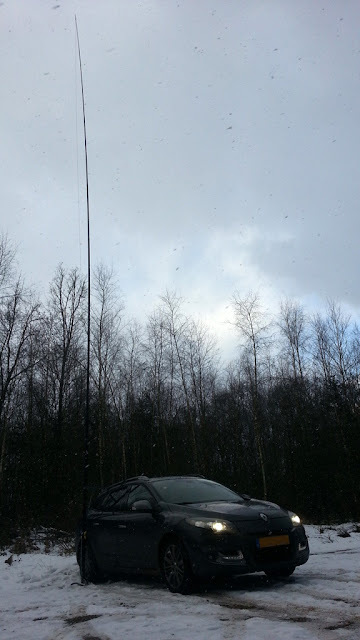 On 20m the first OM to respond was in VE1. So, there were at least some conditions into NA. This was confirmed by another VE OM (this time VE2) and four USA OMs (W1/3/8). In total I logged more than 100 calls in over an hour of radio time on 20m. When I felt that 20m was slowing down I got out and set up my 40m inverted V.
In the next 70 minutes I logged another 90 calls from all over EU. In the more than 2 hours I was on the radio I logged a total of 196 calls from 38 DXCCs. Luciano I5FLN, Max IK1GPG, Jakob OZ7AEI and Vadim R7GA and Alex UR7ET came by on both bands. DX came in from VE, W, 4X, 7X, and R9.